Recently in my volunteer work we met this lady single-handedly taking care of 5 children aged between below 1 to 5. We were concerned about the lack of schooling for the children, especially the older ones and, out of concern, asked the oldest whether he knew his alphabets and numbers, which he didn’t in English but did in his mother tongue. I was asked whether Sophia knew her alphabets and I (too) proudly and quickly said yes, which promptly got everyone worried about the 5 year old not knowing things that a 2 year old knows. BUT, Sophia doesn’t really speak Mandarin and the boy was fluent in his mother tongue (or so it seems to me, who’s a non-speaker of said mother tongue), so who’s to say who’s more developed. Anyway, the whole episode just got me thinking more about language again. My grand plan was for me to speak English to Sophia and the entire family speak Mandarin so, if anything, wasn’t she supposed to be lacking in the English department? I have no idea why she decided she would speak only English. All the schools she attends adopt the immersion program whereby an English and a Mandarin teacher will be in the class all the time and speak in their respective allocated languages. I tried for months to get my father, who’s her primary caregiver to speak to her in mandarin but he would always slip back into whatever language she spoke in. I tried to get the daddy to speak more to her but that is, as many mothers know, a lost cause. So out of desperation I spoke to her occasionally in Mandarin and was told off for confusing her! So how oh how am I going to get the situation to improve? Even the teachers of the chinese playgroup she attends asks us why does Sophia not speak Mandarin when her parents’ Mandarin is so good. We have no answer. Does anyone have any ideas on how to reverse the situation? Will she start speaking in a language I do not understand? I don’t know why I started showing Sophia youtube videos, I think I was (again) inspired by how cute Kirsten (of Mother Inc. fame) looked singing “Part of Your World” and tried showing it to Sophia. She kind of liked it but you tube surfed over to Mickey Mouse Clubhouse which led to La Chateau de Mickey which led to this cute French cartoon about a donkey and Sophia’s hooked. By the way, there’s a bit of disagreement about what Trotro is, and seeing as neither of us actually speak the language, its rather hard to resolve. I think its a donkey cos its got a mane and is grey, but Sophia is certain its a rabbit. We compromised by now calling it “La Trotro”. So now every single day, whenever she remembers (usually when I get home, or before she sleeps or whenever she catches a glimpse of the iPhone or iPad), she demands for “La Trotro”. I wonder whether she will actually pick up the language. Childcare experts say children don’t learn from tv but Sophia has learnt all her alphabets and their sounds from Leapfrog and I daresay I learnt my proper mandarin and cantonese from TV, and the chinese equivalent of Singlish (which is actually a different language or at least surely a different dialect given the great difference) from the streets and daily conversation. So who’s to know. It will be cool to have her pick up a new language just like that. I’m specifically thinking of signing up for twoosy doodlers at Abakradoodle at Rochester. The teacher was great when I went for the trial class and it was really the first time I see Sophia opening up so quickly in a foreign environment, being able to go get materials on her own on her first class. Apart from leading very creative handicraft projects every lesson, the very dynamic teacher also sings and reads to the children and tells them what the handicraft is inspired by. At the end of it, there is gallery time where the children get to showcase their work and talk about it. A great self esteem booster! I do warn that standards may vary depending on teacher because I bumped into friends attending a trial for older children and they weren’t too impressed. I am planning to join a group class which a couple of friends with babies younger than Sophia have already been attending for what must have been almost a year. The trainer is supposed to be really good with children and after the swimming session, which the children enjoy and I’m sure Sophia will too since she loves the water, the parents bring out food and drinks and everyone sits down for pot luck and play time. Doesn’t sound like too hard work does it? Well, this is potentially hard work as I have unfortunately not come across a toddler music school that I really like but I do see that Sophia really likes music. She is always dancing to music and tapping on tambourines and makeshift drums from tins and boxes so I am keen to find a class that she can enjoy while preserving her option of developing a musical niche for herself in future. She stays at home with grandpa after her half day of school and sometimes plays silly games but more often watches DVDs or plays iPad and iPhone games. The classes are so much more engaging right? I’m generally not a big advocate of DVDs because, well its a bit of an unnatural way to learn. And, as the Daddy says, most are really boring. If we adults find it boring, what makes us think that the children will like it? But because I appreciate how hard it is for the grandpa to spend the whole day alone at home with a toddler and sometimes he just needs time to heat milk or heat porridge, I’ve bought some DVDs. We have baby genius (really for babies, if at all), my baby can read (flashcard style video), brainy baby (more interesting than plain flashcard style videos but no storyline), baby mozart in the baby einstein series (really for babies but the more advanced ones could be better), Hi-Five (like normal adults I find them rather irritating. Sophia likes watching but I can’t say she’s learnt anything from it), Thomas (Sophia is not finding the story very engaging at the moment), but mummy and baby’s favourite of them all is….. LEAPFROG. Yep, I really do love the leapfrog dvds. Sophia learnt all her alphabet and phonics from the DVDs and may even have learnt to count from it. She also recognizes concepts like school (she says “I go to school” when she sees Leap carrying a schoolbag). At the toddler stage I would say Leapfrog seems like the best among all the DVDs that I’ve tried. Of course, the other DVDs could be more suitable / engaging at a different stage, e.g. my baby can read or the baby ones could be more stimulating for babies and the ones with more complex storylines may be more suitable for older children. I guess there’s no way of knowing which is the best till you try but my recommendation to parents who don’t mind a bit of tv for your toddlers is try leapfrog. 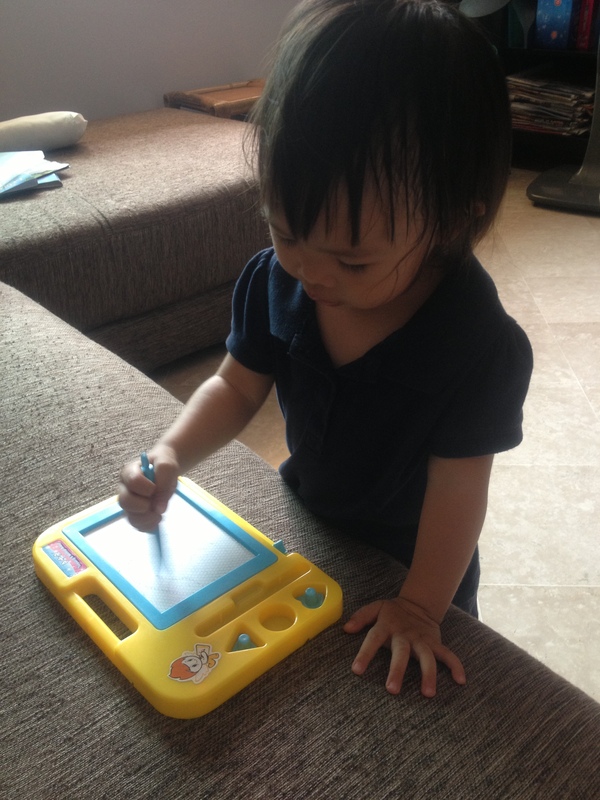 Sophia has been into drawing for the longest time but it is only recently that we begin to sort of make out what she is drawing. These days she’e been doing a lot of circles (faces) with 2 dots (eyes) and a line (mouth) inside. She sometimes pre-warns us what sh’e going to draw so we can see it coming. I’m not going to show the “mummy” ones, which, incidentally are the better drawn ones with circles that are quite round and distinct dots and lines, so here’s one of “peh peh” ie uncle or specifically father’s elder brother in hokkien baby-speak. 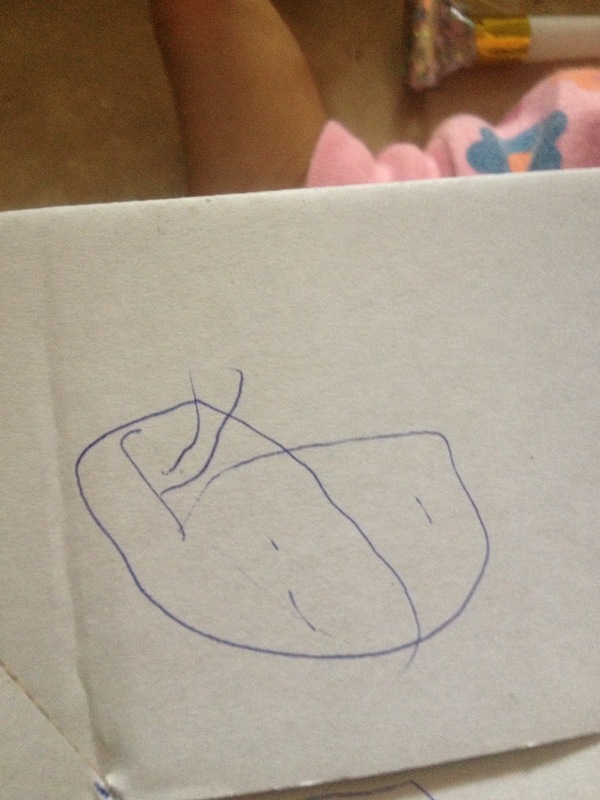 We were quite surprised she would draw “peh peh” because usually its papa, mummy or the grandparents. I just got Sophia one of these from a neighbourhood shop and it was such a great decision. Just yesterday when I came back from work she jumped up saying “mama.. mama..” and headed straight for the board. Once she laid hands on it, she started drawing squiggles that look like nothing but curly pig tails mumbling “m..o..m..p..” (basically a sequence of alphabets that didn’t make sense) and proclaiming “Mummy!” We all clapped and said “well done!” and afterwards I demonstrated how mummy is really spelt by writing and saying it out. I hope she’s not actually supposed to get it at 22 months though, because the next time I asked her to write mummy I think she mumbled “m..o..p..q..” and walked off. The lady at the seven eleven across our apartment and the cashiers at the supermarket nearby all know and love Sophia and often give her leftover free gifts from various promotions. 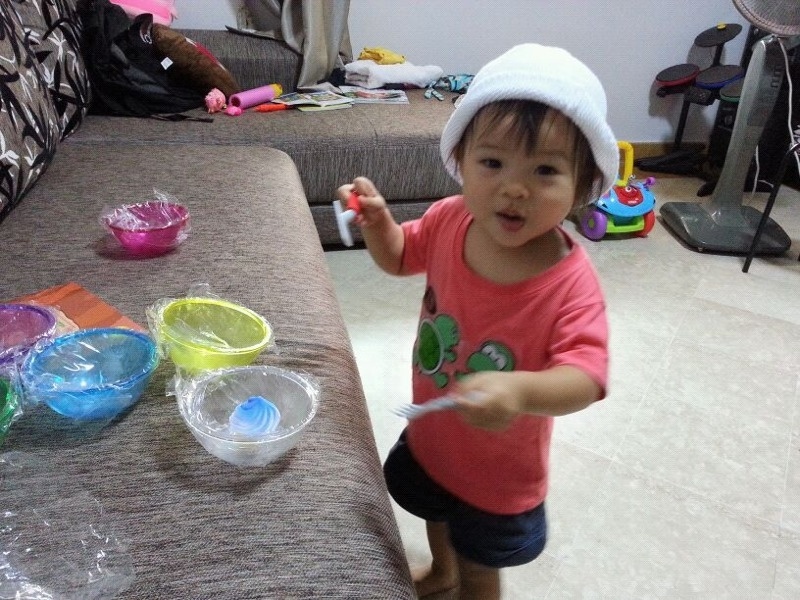 This time, its a set of six coloured bowls and Sophia is having hours of fun stacking them and pretending to cook and eat with them. What fun to watch!